SIOBHAN Cornish may be only 22, but her work ethic and dedication to her customers displays characteristics of a woman who has been in the job for years. 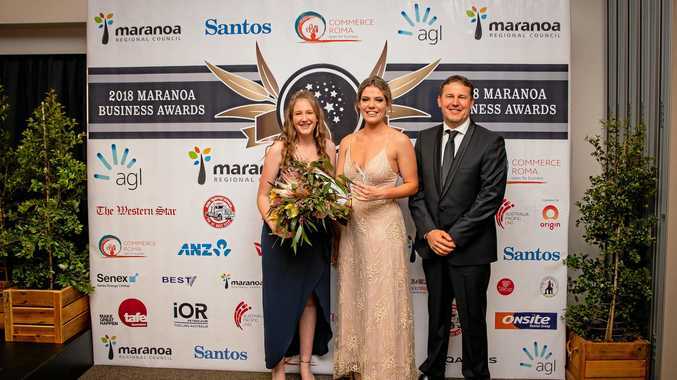 The Black Toyota service department advisor was recently awarded the Maree Bunt Customer Service Award at the annual 2018 Maranoa Business Awards. Overwhelmed by the nomination, Miss Cornish accepted the award on Saturday evening at Explorer's Inn with tears in her eyes. "Winning this award means the world to me. The job is quiet challenging and you do have your highs and your lows, but its really good recognition to be picked for it and to be nominated to start with,” she said. Miss Cornish started at Black Toyota around the age of 18 as a receptionist before moving into the service department. Not only does she have a strong passion for her job, but also for her customers. "My main goal in service department, which I never thought I would do when I first started, is to make sure that what the guest is wanting is followed through and they leave happy with everything,” Miss Cornish said. "This was definitely something that was a whole new world to me with the cars and vehicles and I definitely started from the bottom,” she said. "As you go through you learn certain things and educate yourself about cars. However, despite being a female in a predominantly male environment, Miss Cornish said the Black Toyota team had been by her side since day one. "The whole team here at Black Toyota has been so supportive through this whole process and they always give me the material to do my job properly and are always behind me,” she said. "To other people thinking about stepping outside their comfort zone, 100 per cent go for it.